So far this summer I have read quite the eclectic array of books. I had friends publish books, so I wanted to read those. I also wanted to read some more adult fiction since I spend a good deal of time reading YA lit, however I do love YA lit, so I have still be reading lots of that too. 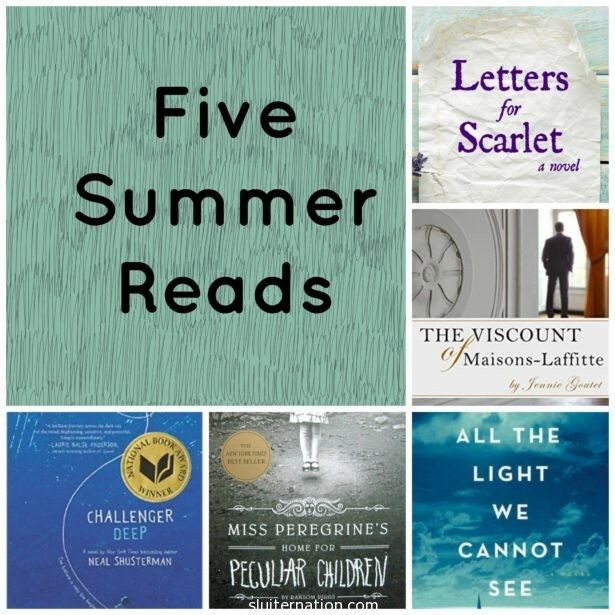 While I have read a LOT of books since school got out (around a dozen or so), these five stuck out as ones I wanted to pass along in case you needed something to read by the pool, beach, or on the couch while the Detroit Tigers are losing. I have a confession. When my friends write a book I get very nervous to read it. I mean, what if I don’t like it? How will I tell them? Thankfully this has never actually happened to me. Letters for Scarlet is written by my long-time blogging friend, Julie. I have read her blog for years and marveled at her ability to write. To be able to hold her book in my hands made me giggle happily. The book is one I would totally choose to read on my own. Corie Harper is a late-twenties English teacher. She and her husband, Tuck are trying to get pregnant, but can’t. One day, Corie gets a letter from herself–one she wrote senior year of high school when she was best friends with Tuck and Scarlet. Corie and Tuck had a falling out with Scarlet and hadn’t heard from her since. Until Scarlet’s mom wants Corie to find her and deliver the letter. Scarlet, on the other hand, does not want to be found. She has a great job and finds out she is pregnant. She thinks having the baby would be a terrible idea. Both women are running from the memories of one particular night their senior year. The book gives you bits and pieces that just keep you turning pages to find out what happened…and if Scarlet will keep the baby…and if Corie and Tuck will make their marriage work. I love historical fiction because I feel like I am getting a glimpse of life from a different time in a way no history class could ever teach me. All the Light We Cannot See does this so beautifully. The story is engaging, sure, but the writing! The writing captured me and just would not let go in the best kind of way. The novel is really two stories that wrap around into one. Marie-Laure lives with her grandfather in Paris near the Museum of Natural History. At age six, she goes completely blind, and he builds her small models of Paris and it’s roads so she can have a 3D map of sorts to learn her way around. When the Nazis capture Paris, they are forced to run away to the walled city of Saint-Malo to live with a reclusive uncle. Marie-Laure is unaware that they have carried something extremely valuable and dangerous with them. Werner is an orphan who lives in an orphanage in a mining town in Germany. He is brilliant at building and fixing radios. The Nazi party catches wind of this and recruits him into the Hitler Youth. Eventually Werner finds himself in the basement of a building in Saint-Malo trying to fix some equipment. His story is about to meet Marie-Laure’s…or has it already? I am so glad I did! This book is not what I would think of when I think of a typical romance…or maybe I have the wrong idea of a typical romance? Chastity is a single mother and high school English teacher in France. One of her students is the son of Viscount Charles Jean Anne de Brase. Now, don’t let not knowing what a viscount is get in your way of reading this one. I know next to nothing about France, and I was able to figure it all out with context clues. Jennie’s writing is accessible to anyone who wants to read it! Chastity is unimpressed with the Viscount’s off-putting personality when she asks to meet with him about his son’s academic performance. She has pretty much written him off as a total rude snob, when her ex-boyfriend–straight from prison for drugs–shows back up and wants to spend time with their son. An accident involving their son throws the Viscount further into Chastity’s life than she could have imagined. This book may be my new favorite YA read. Having dual narrators is hot right now, but Schusterman takes that to a different level by having the narrator always be Caden Bosch, but from different states of mental health and awareness. Sometimes he is first-person narrating from the reality of his family and friends, other times it’s from aboard a ship with a deranged Captain and a talking parrot who both give him direction. Is he hallucinating? Is this a different world he has created for himself? Does he have another personality? Other times he falls into second person narration when he seems the most disconnected from reality. His ship world and the “real” world are connected, but you have to keep reading to find out how. This might be the most beautifully tragic journey into and through mental illness that I have ever read. Anything in the genres of paranormal or fantasy are a big stretch for me. In fact, I have never read Harry Potter (Don’t shoot!). But I had A) heard this was very good and B) let myself get intrigued by the real photos that were used. I flipped to the back of the book and learned via the interview with Randsom Riggs that he found all the photos first and would write little stories to go with them. I found this a fascinating way to jump start a novel. Jacob, a sixteen-year-old, finds himself traveling to a remote island off the coast of Wales in search of some family history. He finds, instead, and abandoned house that used to be Miss Peregrine’s Home for Peculiar Children. After searching some more, he finds that maybe these children were more than just strange…and maybe, somehow, they are still alive even though it is said they were all killed in a bomb attack during WWII. Just like with Stephen King novels, I found myself drawn to how real Riggs made everything seem before introducing the paranormal/fantasy elements. I was already drawn in and invested in the characters before what would normally turn me off occurred. I was already hooked! I look forward to the next in the series (that I will have to borrow from my own classroom library!). So what have you read so far this summer? Anything I should add to my list? Katie, I’m THRILLED to be included in your list – thank you so much! I know you’re a voracious and discerning reader so this makes your endorsement all the more wonderful. Thank you SO much for including mine, beloved friend! I just told my mom about you (she is a literature aficionado) and she’s so impressed with what you’re doing in the school with the library.